Met L Flo Inc. offers vacuum forming, also known as “vac forming”, for large and small scale surface plastic parts. Met L Flo Inc. utilizes both pressure and suction vacuum forming to produce low volume parts in production materials. The A great service to consider is the combination of direct digital manufacturing or 3D printing with vacuum forming to rapid prototype parts and customized parts. For more information on vacuum forming services from Met L Flo Inc. give us a call now at 1.800.MET.L.FLO (800.638.5356) or fill out the easy-to-use form along the right as someone from our staff will get back to you as soon as possible. The most common benefits of vacuum forming comes from the prototyping and fabrication phase of a product’s development. During the prototyping and fabrication phases of a product, vacuum forming can speed up the process with rigid parts cut from anything like wood or metal and shaped. That form can be quickly vacuum formed and used without any additional sculpting, milling, or refinement. Being fast as well as using a thin layer or material for vacuum forming also allows for cost saving. A single sheet of vacuum forming material can create several pieces to test, modify and refine. Reducing the cost of modeling multiple iterations of the same piece that could have flaws or variations. One big plus to vacuum forming with plastics is the environmental impact on using the material. Certain plastics, once damaged or decommissioned parts can be recycled and reformed into new plastic products. The vacuum forming process utilized by Met L Flo Inc. incorporates a sheet of plastic material of varying thicknesses, dependent on the application, that is carefully heated until the sheet is pliable for forming. Once the sheet is heated, it is then applied to the object being vacuum formed and a series of holes in the surface of the vacuum forming table allows the whole surface area to be evacuated of air so that a tight form fit is produced around the part. Multiple pieces can be produced from a single sheet depending on the size of the object being vacuum formed which is another cost saving piece compared to 3D printing which is single pieces per run. 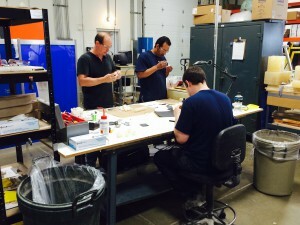 Met L Flo Inc. offers both production and product development services for product prototypes. We can produce your products to specification from digital files or fabricated prototypes and then vacuum forming can be used to mass produce them or further develop the product. Our experienced staff of fabricators and engineers can help solve problems before the parts go into production so it’s a great idea to consult with them before taking that final step. For more information on vacuum forming services from Met L Flo Inc. call us now at 1.800.MET.L.FLO (800.638.5356) and let us help your products get done. You can also reach us through our easy-to-use form along the right and enter as much detail as possible and one for our team members can gather information for you and reach out to you when we have more details to go over. We look forward to working with you on your next vacuum forming or prototyping project.